PU Leather & Canvas exterior; interior stretch-mesh pockets and flannel for an elegant look and comfortable feel. Size: 25.5cm (Lenth) x 11cm (Width) x 5cm (Thickness) , easily fit into any backpack or handbags. 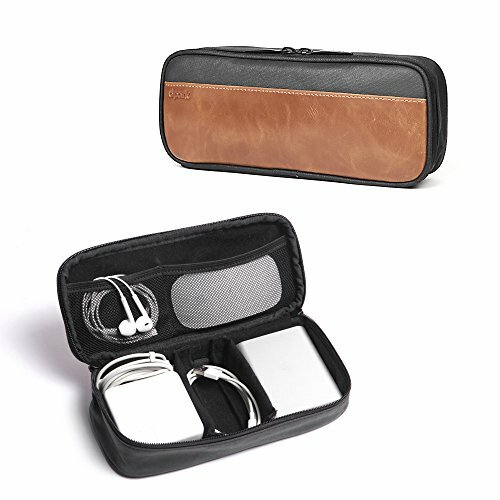 Interior offers secure storage space and prevents scratches, dust, water and accidental dropping. Universal travel case stores and protects small electronics, power adapters or cosmetic. Free collocation, can be combined in any way you like; these adjustable dividers that can make this even more personalized to your needs.